My New System of Routine - Approved by Lord Fisher but generally Opposed - What Naval Gunnery means - No further Employment at Sea - Back to Director Firing - Success of the Neptune Trials - The Thunderer and Orion Test - Superiority of Director Firing demonstrated - More Admiralty Delay and a Stiff Protest - Warning unheeded and Proposals rejected - Tragic Fruits of Neglect - History of Parallel Firing - Position of the Director Firing at the Outbreak of War - The First Dreadnought - Position of the Mast - Perpetuating a Blunder - Mr. Churchill's Wise Decision - A New Blunder in Exchange for the First. ON my arrival in London after transferring my command, I saw the First Lord, Mr. McKenna, and the First Sea Lord, now Lord Fisher of Kilverstone. As already described, I had introduced a new routine in the Second Cruiser Squadron, economising the time which the men spent on housemaiding duties, in order to obtain farther opportunities of training them in their war duties. The First Sea Lord, who was then completing the series of naval reforms which were to save the Fleet from defeat and the Empire from ruin, discussed the new routine I had introduced. He approved of the modifications I had made, but added that I was far too much ahead of my time, and that my departure from tradition had caused a good deal of annoyance in some quarters. with King Edward VII. He was much interested in the visit to South Africa, and desired me to explain to him the new system of instruction I had devised and its effects.
" Hitting with heavy guns is a subject to which I have given some attention, but it is not quite easy to talk about it except to my brother officers, as naturally some of the most interesting points in connection with it are confidential. I can tell you some of the difficulties with which we have to contend, but I cannot, in all cases, tell you how we overcome them. Gunnery is a term that I do not much like, as it has often been used unassociated with hitting. Hit first, hit hard, and keep on hitting is what we have to do if we want to win. Strategy and tactics count for nothing if we cannot hit ; the only object of a man-of-war is to hit. inches of armour at thirteen miles, strikes a blow of 53,000 foot-tons, and costs about £100 every time you let it off. Its shot is six times my weight, in circumference it is what I am round the chest, in height it is four inches shorter than I am. The home for this projectile is the enemy. The art of gunnery is to get it to that home. To arrive at that we point the gun at the moment of firing at a certain spot - that spot is not the spot that you want to hit ; the gun must be pointed high, so as to counteract the effect of gravity. The wear of the gun, the temperature of the air, the density of the air, the strength and direction of the wind, must all be taken into consideration when settling where you are to point the gun; wind is a difficult factor to deal with, as it may be blowing at different strengths, and in different directions, at the various altitudes through which the shot passes. In firing at a range of fifteen miles, which is possible, the shot would go to an altitude of 22,500 ft., which, if my geography is correct, is 7,500 ft. over the summit of Mont Blanc. You will realise what a variety of atmospheres it would pass through, and how impossible for any one on earth to divine what will be the direction and the force of the winds it will meet with in its ascent and descent. When a mass of iron the size of my body has to pass even five miles through the air you may imagine what a difference wind behind it, or in front of it, or right or left of it, will make in its final destination. destination ; during that time the ship it is being sent to, if steaming at the rate of twenty knots, will have changed her position 120 yards. We must point our gun in a direction which allows for this. Then there is the forward movement of your own ship, which will be imparted to the projectile, and must be allowed for, and there are other corrections to be applied. To hit under these circumstances will appear to you a very difficult problem, and it is. We only expect to get our first shot approximately near ; if we succeed in this, then the remainder is fairly easy. The same rule governs hitting at five miles that governs shooting across this room - you look where the shot has gone and correct your aim accordingly by pointing the gun more up, or more down, or more to the right or to the left. If you have not seen much heavy-gun practice at sea, you may wonder how we can at five miles see the splash made by a shot striking the water. The answer is very simple - the column of water thrown up is larger than a battleship. 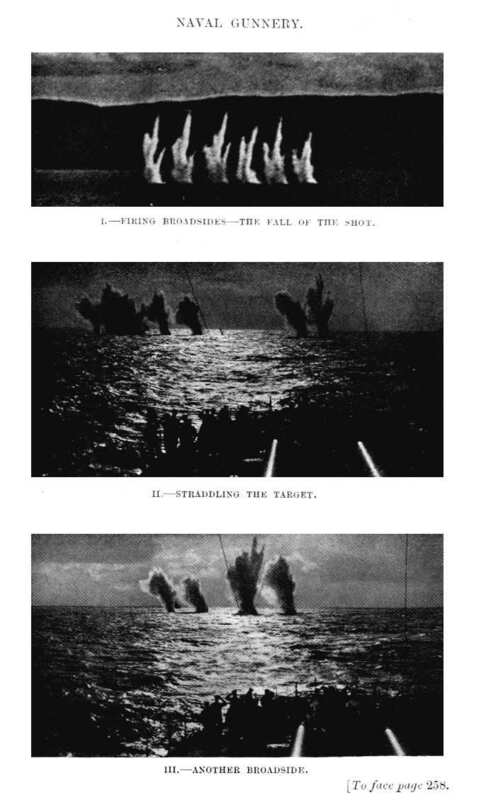 Here is a picture of a battleship showing the splash made by a projectile superimposed on it. Both are the same scale. You will observe that the splash is higher than the battleship's mast. I estimate that it contains about 2000 tons of water ; such a splash would drown a small ship. between the eye looking through the telescope and the hand on the wheel is established. As the ship moves, so they instinctively move their wheels to counteract it - in the same manner that one's hand moves the handle-bar of a bicycle.
" We have now got as far as pointing the gun, and that if you do not hit you correct your aim until you do hit. Here another difficulty comes in. In firing at a target across the room, we can see if we have made a bull's-eye - at a longer distance on a rifle-range if we make a bull's-eye it is signalled. In naval warfare at the distance we engage at we cannot see whether we have hit or not, and we cannot expect the enemy to signal to us that we are hitting. He may intimate to us that we are hitting by running away, sinking, or catching fire ; but we want an earlier intimation of hitting than this, and we get it - but the method I cannot disclose.
" That we are able to master most of the difficulties to which I have referred is proved by the fact that we now make a higher percentage of hits at 8000 yards than we did a few years ago at 1000 yards." 1 They really had no system. be sure to clash with those of my superiors, who had no wish to abandon the routine followed by the Fleet with little alterations since the sail era. About this time the Admiralty suggested to me that I should probably not hoist my flag again, and that I should be doing more service to the country by continuing my work on director firing than by going to sea. The irony of this assurance appealed to my sense of humour, for I well knew that the Admiralty, as a body, were moving heaven and earth to prevent director firing being adopted. Nevertheless, fully realising that I was relegated to half-pay, I busied myself about this special work. The invention had been on the shelf at the Admiralty for six years, and was strenuously condemned by those who had not taken the pains to study its possibilities, or even to understand it. Fortunately for the country, Sir John Jellicoe was now a member of the Board, being Controller of the Navy, and he decided to fit it in H.M.S. Neptune. In conjunction with Messrs. Vickers, I prepared drawings, which I took to the Admiralty in June, 1910. They were approved, the work on them was started, and in December, 1910, the installation on board H.M.S. Neptune was completed. About the same time the Admiralty realised that, though I had been working on this scheme of director firing for more than a year, I had received no pay for so doing. On the 14th June their Lordships wrote to me to the effect that they were pleased to appoint me on committee pay while associated with the Admiralty in connection with director firing. Before passing on, I should refer to my flying visit to Mexico. In March, 1910, I received an invitation to travel from New York to the city of Mexico and back in a special train, which would stop at all the places of interest en route. In Mexico I was to have the honour of being presented to the President, General Porfirio Diaz. That prospect quite settled the question ; I accepted with pleasure, for I had always regarded General Porfirio Diaz as one of the most wonderful men in the world. From the conquest of Mexico by Cortes in 1520 to the death of Maximilian in 1867, the country of Mexico had been in a constant state of war, either driving out invaders or coping with internal revolutions, the latter chiefly brought about by the greed of the Church. With the death of Maximilian and the evacuation of the French, all foreign interference ceased, and the Mexicans began to govern themselves ; but it took ten years for them to find a man with a sufficiently iron will to exterminate the clerical greed for power and plunder, and to stamp out the brigands that infested and ruined the country. country had only been scratched, and a vast area was still unexploited. It was apparent to me that there was nothing that the country would not either grow or yield. Even in my short tour I passed through land rich in oil ; I saw gold mines, silver mines, copper mines, precious stone mines, and was told that there was an abundance of every metal. As regards agriculture, everything seemed to grow ; even the desert where one saw nothing but sand dotted over with cactus trees only wanted water on it to change it into the most productive soil. After passing over hundreds of miles of desert, we emerged on to a plateau of rich soil, where fruit of every description was growing in profusion. It was the same desert, but it had been watered by an irrigation company then recently started by President Diaz. From my visit to Mexico, seeing it as I did in prosperity and with almost unlimited possibilities, I came to the conclusion that it would become the richest country in the world, and I was naturally very anxious to meet the man who had changed it from a country of bloodshed and brigandage to one enjoying peace and prosperity, and who had started the development of its resources and riches. was told that he was the son of an innkeeper and that his grandmother was a pure Indian of a Mexican tribe who were renowned for the beauty of their women and the savageness of their men. With advancing age, his iron will (so necessary in Mexico) relaxed, the revolutionists became active, and Diaz was compelled to retire from the Presidency and leave the country he had hardly ever been out of during the eighty years of his life. President after President succeeded Diaz, but they only acted for a short time, assassination or resignation terminating their periods of office, and the country soon fell into a worse state of brigandage than it had ever been in. Later on the control of Mexico fell into the hands of two men, Villa and Carransa, whom it would be gross flattery to call brigands. Under their rule atrocities obtained as bad as those committed by the Germans during the War ; the city of Mexico was pillaged ; civilians and priests were murdered ; and the nuns in the convents subjected to unmentionable treatment. statesman ; he knew men and how to manage them, and he feared nothing. He was the strong man that Mexico wanted and that England wanted badly during the war. This wonderful man, the maker of Mexico and Mexico's truest patriot, died an exile in Paris on the 2nd July, 1915, in his eighty-fifth year. In January, 1911, I joined H.M.S. Neptune to superintend the trials. A month was spent at Aranchi Bay, Sardinia, in testing the instruments and in educating the officers and men in their use. On the 11th March, 1911, at Gibraltar, the final trial took place, and proved most successful. At a subsequent interview at the Admiralty, Mr. McKenna, then First Lord, remarked that the Neptune had attained such a rapidity of fire that she would expend all her ammunition in thirty minutes, which would never do. I pointed out that if the shells hit their targets the enemy might be sunk in thirty seconds. This was a view of the matter which was apparently new to him. Sir John Jellicoe, who by that time had taken up his appointment as Commander-in-Chief of the Atlantic Squadron, was present at the trial, and on the strength of it he advised the Admiralty to fit the director to all ships at once. This the Admiralty were reluctant to do, and they were supported in this opposition by Admiral Sir Francis Bridgeman, then Commander-in-Chief of the Home Fleet, and flying his flag on board H.M.S. Neptune, the only ship in which it had been tried. Matters were thus delayed a great deal, and it was not until late in the year that orders were given for the Thunderer to be fitted. Mr. Winston Churchill, who had become First Lord, informed me that he was determined that the system of firing should be given a fair trial, and asked what I thought would be the best way to arrange it. I suggested that the Admiralty should tell off a ship similar to the Thunderer, and that they should go out together and fire at separate targets, thus ensuring the same conditions of wind, light and weather for both ships. Mr. Churchill considered this a fair and sporting offer, especially as it left the Admiralty the power to choose their best ship and one which had been longer in commission than the Thunderer. There were many delays and changes in the programme, and it was not until November, 1912, that the final trial came off. The Admiralty selected the Orion; she had been nine months longer in commission than the Thunderer, and had the reputation of being the best shooting ship of the Navy. shooting and the Orion sending her shot all over the place. At the end of three minutes " cease fire " was signalled, and an examination of the targets showed that the Thunderer had scored six times as many hits as the Orion. The superiority of director firing was thus demonstrated, and the country has to thank Sir John Jellicoe and Mr. Winston Churchill for its introduction into the Navy. Had they not intervened, the opposition to it would still have been maintained, and we should probably have gone to war without any of our ships having an efficient method of firing their guns.
" A great extension of the system of director firing, by which one officer or man could lay and fire all the guns, was made. The situation in this respect before the War was that a few ships had been fitted for the system which had been devised by Admiral Sir Percy Scott. But a very large number of officers were sceptical as to its value compared with the alternative system ; there was considerable opposition to it, and the great majority of the ships were not fitted. In some cases the system was not favoured even in the ships provided with it. 1 "The Grand Fleet, 1914-1916." of the director system. I was able to press these views on my return to the Admiralty at the end of 1912 as Second Sea Lord, and it was then decided to provide all the later ships with the arrangement. Little progress had, however, been made when the War broke out, only eight battleships having been fitted. "Early in 1915 arrangements were made, with the assistance of Sir Percy Scott, and the warm support of Lord Fisher, then First Sea Lord, by which the battleships and battle cruisers were supplied with this system, without being put out of action or sent to a dockyard for the purpose. The necessary instruments were manufactured at various contractors' shops, and the very laborious task of fitting them, and the heavy electric cables, on board the ships was carried out by electricians sent to the various bases. The complicated work naturally took a considerable time, and many vexatious delays occurred ; but gradually all ships were fitted, Sir Percy Scott rendering invaluable assistance at headquarters.
" As a first step, the system was fitted to the heavy guns mounted in turrets, and by the date of the Battle of Jutland there were few ships that were not supplied with the system, although six of those last fitted had not had much experience with it. "The conditions under which that action was fought converted any waverers at once to a firm belief in the director system, and there was never afterwards any doubt expressed as to its great value. were then still many who were unconvinced. However, during the remainder of 1916 and 1917 the work was pressed forward, and the system became universal for all guns and in all classes of ships." When Lord Jellicoe refers to " few ships " being without the director firer at the Battle of Jutland, he is dealing only with the main armament. 1 The work of completing the equipment of the Fleet, main guns and secondary guns, had not, indeed, been finished when the Armistice was signed. "The Germans, I am informed, have for some years used a very good modification of the Director System, which allows them to fight the guns of their ships in parallel. As we cannot do this efficiently, it gives the Germans such a superiority in gun-fire that if a British Fleet engaged a German Fleet of similar vessels, the British Fleet would be badly beaten in moderate weather, but annihilated if it was rough.
" I make this statement with profound regret and concern for my country, but no one with any knowledge of the modern conditions of shooting can contradict it. 1 Of. "The Grand Fleet, 1914-1916," page 374. "For six years I have urged their Lordships, the Commissioners of the Admiralty, to adopt a system of fighting the guns in parallel ; had I not done so, and did I not continue to urge it, in the event of war I should feel myself criminally responsible for the defeat we should sustain if our Fleet engaged another Fleet in which the guns are fitted for firing in parallel." This letter was tantamount to accusing their Lordships of jeopardising the safety of the nation, and I hoped that they would either try me by Court Martial for so indicting them or take some action which would give our ships a chance of success, if they had to fight an action in rough weather. Their Lordships did not like the kindly warning I had addressed to them, and they did nothing. On the 10th February, 1912, I wrote another letter, making suggestions for improving the firing of the Fleet. Three hundred and seventy-three days after the receipt of this letter, that is, in February, 1913, their Lordships replied that it had been decided not to adopt my proposals at present. To me, a year and eight days appeared rather a long time for them to take in making up their minds, but at the Admiralty time was of no consequence. I had expected, what I had predicted, and what I had strenuously tried to avert. Fifteen hundred brave officers and men were sacrificed because the Admiralty had not fitted the ships with any means for fighting their guns in a sea-way. The Germans said that the shooting of the Good Hope and Monmouth was very bad. No doubt it was, but this was no reflection upon the gunnery ability of Admiral Cradock and his officers and men. We may be quite certain that they bravely and skilfully fought the guns. Failure to hit the enemy was in no way due to want of skill ; it was due to the ships lacking the necessary instruments to enable them to use their guns efficiently in rough weather. In a sea-way when a ship is rolling, there is only one method of effectively using the guns ; they must be laid parallel and fired simultaneously as a broadside. To arrive at this, certain instruments are necessary. The Good Hope and Monmouth were without these instruments, and as a consequence they were unable to use their guns effectively against the enemy. parallel to the line. In this way all the guns of the broadside were placed fairly correctly for direction, and the allowance for convergence was introduced. For elevation a wooden batten was used, marked in degrees with a good open reading ; the guns were laid by it and fired simultaneously by word of command. From the foregoing it will be seen that half a century ago we could lay our guns parallel for direction and elevation, and fire them simultaneously as a broadside. This is exactly what we re-introduced into our Navy in 1914. We called it by three names - Parallel Firing, Director Firing, or Broadside Firing by directing gun. It must appear strange to my readers that we re-introduced in 1914 a system of firing that we had in the Navy fifty years before. The question naturally arises, if it was a good system, and if it was the only system by which guns could be fought when the weather was rough, why was it ever dropped ? I will explain. As the guns and mountings improved, so improvements were made in the converged firing arrangement I have already described. The introduction of electric firing enabled the guns to be fired from a position aloft, or remote from the guns. 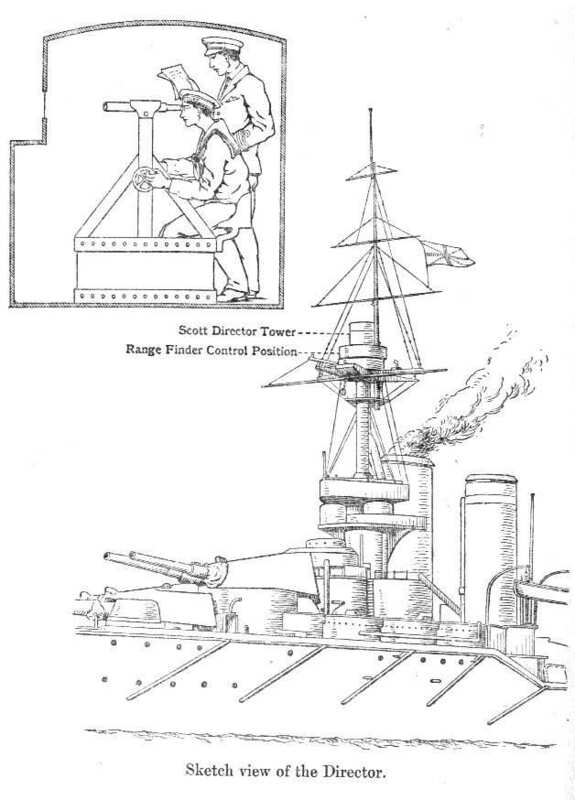 This caused director firing to be introduced, the director being a sort of master gun sight which was placed in some position from whence the officer operating it could obtain a good view of the enemy. 1 Afterwards Vice- Admiral Sir Richard Peirse, K.C.B. efficient communications, difficulties arose and this description of firing was given up, broadside firing by directing gun taking its place. In rough weather this was an exceedingly effective manner of firing simultaneous broadsides, and it was generally adopted by us and all foreign nations. It was such a good method of firing the guns that one would have thought it might have been kept secret, but a full description of it appeared in our drill book, which could be bought by any foreigner for a shilling. In 1897 we commenced putting our guns into casemates, that is, a sort of armoured room ; each gun was in a separate room and the communication between them was very bad. 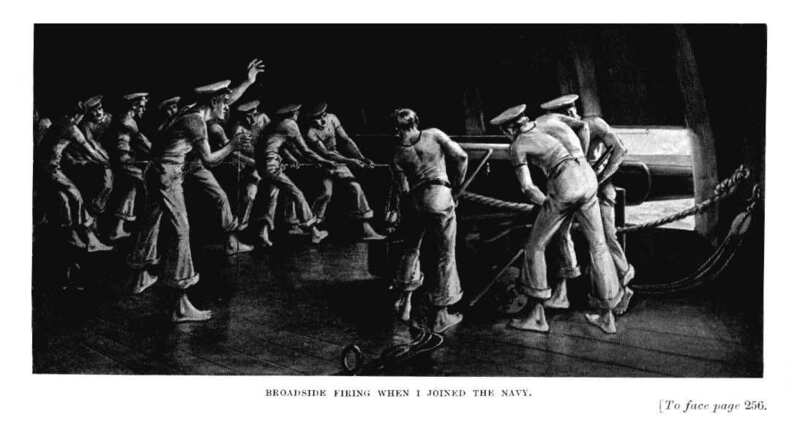 This precluded us from using broadside firing by directing guns. Consequently after that date we had no form of parallel firing, which meant that we had no effective way of using our guns in rough weather. It was to solve this problem that, in 1905, I revived director firing, and, owing to the great advance that had been made in electric communications, was able to devise a very good form of it, the details of which have been kept secret. 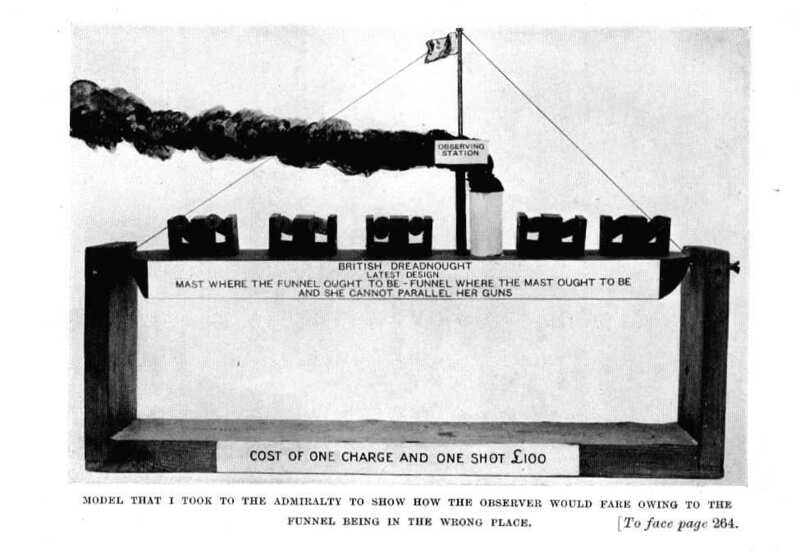 I submitted the invention to the Admiralty, who had it secretly patented, consigned it to themselves, and then boycotted it until 1911, when, as explained, Sir John Jellicoe insisted on H.M.S. Neptune being fitted with it. jeopardised the safety of the Fleet, which means the safety of the nation. That they could not carry out a chasing action, as when at high speed the spray washed over the gun sights and prevented the men from seeing the enemy. With the wind in certain directions the smoke from the foremost guns interfered with firing the after guns, and so prevented the ship from making full use of her armament. These were two very serious and grave defects, for they materially reduced the power of a Dreadnought ; and they obviously should have been eliminated if possible. The Admiralty had two courses open to them. To adopt director firing, which eliminated both of the defects named. To arrange that when practising for battle no right ahead firing took place, and that the target should always be in such a position as regards the wind that the firing ship was not inconvenienced by smoke. The Admiralty adopted course (b), and as a consequence of this, for five years our officers and men were trained in a system of firing which could be effectively used only when the weather was fine and the enemy was met on a restricted bearing as regards the direction of the wind. In the meantime the Germans were fitting all their ships with a system of firing very similar to director firing. fitted in twenty-nine of our Dreadnought battleships and battle cruisers, but the Admiralty did not hurry. No start was made until 1913, so when in August, 1914, war was declared, the British Navy had only eight ships fitted. But what was most strange was that, when war came, work was stopped on the other twenty-one ships, and was not resumed until three months afterwards, when I returned to the Admiralty. The jealousy and quarrelling in Service circles in England during the War was a valuable asset to our enemies. In 1904 the advantage of directing the fire of guns from aloft was apparent to all gunnery officers, and it was recognised by them that the only object of having a mast was, to give the officer in the ship an elevated position from whence to control the fire, and to carry a wireless. In this year Lord Fisher's Dreadnought was designed. She was a sensational ship, representing the initiation of a new type. In tonnage, speed, and armament, she beat all battleships then afloat. to build serviceable cruisers with one pattern of gun only, and all on the middle line. The Dreadnought had the then wonderful armament of ten 12-inch guns, which, if properly equipped and handled, would have made her the most powerful ship in the world. But she was launched into the Fleet without a method of fighting the guns being considered, and to make matters worse the mast which carried the observation station whence the guns were to be controlled was placed abaft the funnel, so that the unfortunate officer controlling the firing of the guns would be roasted. On one occasion, after the look-out man had gone aloft, the ship steamed at a high speed against a head wind, so that the mast near the top of the funnel got almost red-hot. The result was that the look-out man could not come down for his meals, and it was necessary to hoist food up to him by the signal-haulyards, which had luckily not been burned through. In the next class, the Temeraire, Bellerophon, Superb, and in the following class, the St. Vincent, Collingwood, and Vanguard, as well as the Neptune, this blunder was not repeated ; the mast was put before the funnel, and the observation station upon it was therefore available for the purpose for which it was designed. the funnel before the mast. Such a decision practically meant that the ships would be of no use for fighting purposes, unless they went stern first into action. I took the liberty of pointing out this amazing blunder to the Admiralty, and got myself very much disliked for my pains. The Board of Admiralty were well aware of the blunder that they had made, but they wanted it hushed up, instead of being reminded of it. Mr. McKenna's reply was evasive. He said that the design of a ship had to embrace possibilities of which I was perhaps ignorant, and which were confidential. That was a ridiculous and absurd statement. What could be confidential so far as I was concerned ? He could give me no reason for putting the mast in the wrong place ! That was the fact to be concealed. The position then was this : the Colossus, Hercules, Orion, Thunderer, Monarch, and Conqueror all had the funnel where the mast ought to be, and the mast where the funnel ought to be. To make matters worse, it was decided to repeat the blunder in the Indefatigable, New Zealand, Lion, Princess Royal, Queen Mary, and the Tiger. ability of the observer and the height of the position assigned for him to observe from ; that practically the all-important detail in the design of a fighting ship was the position of the observation station; that we were ignoring this fact and putting the observation station in a position which made it actually untenable under most conditions of wind. Mr. Churchill saw what a bad mistake had been made, and asked me what could be done. I replied that only one thing was possible - namely, to take the funnel and mast out and change their positions ; and that would probably cost about £50,000 to £60,000 per ship. The First Lord, with his characteristic boldness, overrode the opinion of his naval colleagues and insisted upon this step being taken. This must always be a good mark for Mr. Churchill. 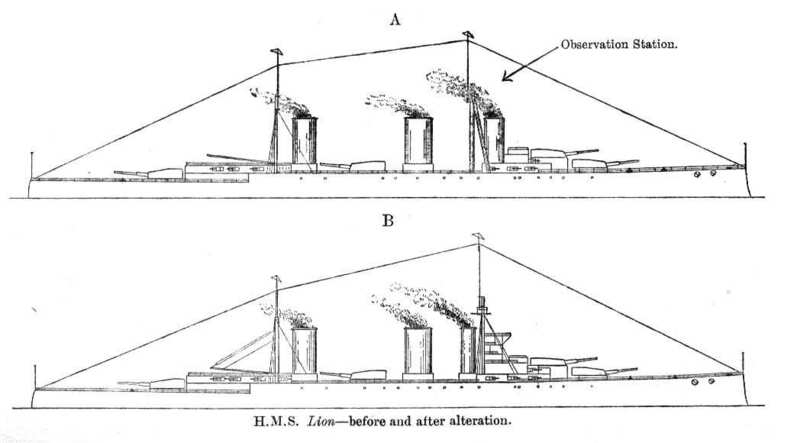 The first ship to be taken in hand was the Lion, and she was altered as shown on the following page - from " A " to " B." that as they were quite certain that it would never be adopted, he had been obliged to agree to their proposals that a light mast, capable only of carrying a small observation station for the officer directing the fire, should be put in, instead of one suitable for carrying a director tower. Thereupon I pointed out to the First Lord that his Board were ignorant and did not know what they were talking about ; that their objection to director firing was not founded on substantial reasons; and that their stupid decision would put the country to the expense of carrying out fresh alterations in seven ships - either strengthening the masts they had put in, or pulling them out and putting in new ones. Mr. Churchill's reply was to the effect that he could not alter the policy of the Board ; and I do not think he ought to be condemned for this decision, because the question was purely a naval and technical one. As I failed in my attempt to avert the blunder with the First Lord, I tried the First Sea Lord, but met with no success, and the blunder was perpetrated. Subsequently, of course, the masts of all these ships had either to be taken out or strengthened, at an enormous expense to the country.